The flowers that lined the walkway from the main building at Lantana Galu Beach to the outdoor path were absolutely breathtaking. What a perfect spot for a wedding! The menu at Le Café at Lantana Galu Beach was a plethora of appetizers, meats, poultry, fish, shellfish and side dishes suitable for the finicky of diners. Vegetarian options were available as well as foods easily amenable to my low carb, gluten free, starch free, grain free, sugar free diet. There were more possible combinations than we've seen on any other menus thus far in Kenya. I never doubted for a moment that the chef would make an error in the preparation of my restricted meal. The elegance and grace of the establishment bespoke a keen sensitivity for the needs of its customers. The service...flawless. With neither of us starving, we didn't partake of any appetizers or salad. Most certainly, next time we go to Le Café, we'll surely experiment trying more dishes. ﻿My plate, as shown above was flavorful, albeit the lack of sauces and starchy side dishes. It may sound difficult, if not impossible, for a restricted diner such as myself to assess the quality of food without the usual sauces and side dishes. In my perception, the true test of a great restaurant is in their ability to masterfully take the simplest of foods with the least amount of ingredients to ultimately turn out an epicurean delight. This was accomplished at Le Café with finesse. An otherwise bland snapper resulted in a flaky and flavorful entrée, enhanced with the subtle use of local spices, grilled at precisely the correct time and temperature and presented with this perfect blend of al dente sautéed vegetables. Notice the lack of veggies on Tom's plate? He requested they be placed on a separate plate to be handed over to me. I did the same with my potatoes, handing them over to him. My only suggestions for my dinner was to have smaller carrot bites to avoid the necessity of cutting, as my knife couldn't quite tackle the job. Secondly, the pea pods could have been strung more completely to avoid that awful green string stuck in the back of one's throat and struggling to find a gracious manner of extracting it. A simple tomato and cucumber garnish adds the finest little touch. Tom gave me this also. The only raw vegetables he'll eat in carrots and celery. For beverages, Tom had two local Tusker bottled beer approximately half liter each (16.9 oz.) and I had my once a week treat of one Coke Light (sugar free) with lots of ice and a straw, switching to water when done. (The water at Le Café is purified as if often the case at the finer restaurants in Kenya. We suggest you ask, if unsure as to the purity of the water). After our walk back to the main building, once again, we were mesmerized by these gorgeous fresh flowers. HERE'S THE SHOCKER, FOLKS!!! Our entire dinner including beverages was Kenya Shillings $2500 which translates to US $28.61 (including tax and service fee!). We added a tip for our server for Kenya Shillings $1000, US $11.44 for a grand total of Kenya Shillings $3500, US $40.06! The buds for the sweet smelling flowers was intoxicating, as in a fine perfume. With our cab fare and tip for Kenya Shillings $1500, US $17.16, our entire total for the evening at an extraordinary resort, an memorable dining experience and service beyond all reproach, was US $57.22! An exterior window of one of the units was adorned with more of these flowers. Wouldn't this make a lovely bridal bouquet? Just as we began to exit the main door, this red plant caught Tom's eye. Last night, our waiter at Le Café at Lantana Galu beach offered to take a photo of us. Gee...we've lost our tans. With a solid recommendation from Hans plus numerous excellent reviews in TripAdviser.com, we decided to try Le Café at Lantana Galu Beach last night for our Saturday dinner date night. Although only a very short distance, the drive to the property took nearly 10 minutes over the bumpiest road we've seen so far in Kenya; unpaved, laden with potholes, definitely not suitable for the queasy. Heading south on the road outside our property for the first time, we were distracted by the various resorts we'd yet to see, making the bouncy ride less annoying. This is the entrance to the main building. A long walk was required on a poorly lit path in order to reach the restaurant located on the beach. It proved to be well worth the walk. The excitement of trying a new restaurant each Saturday night creates a refreshing sense of anticipation after a few days of quiet contemplation in our outdoor living room. With us, there's always a bit of trepidation of going out. We seldom dined out in our old life. But, this is our new life that includes making the effort to find something to wear and get ourselves out the door. The waiting area in the lobby of the resort. Apartments and condos are sold at this resort to later be rented and managed by the company, a similar concept we experienced at LaruBeya where we lived for over two months in Belize. In every case, once we're on our way, we smile at each other, thrilled that once again we've pushed ourselves to explore, try something new, step further outside the box. We now realize how complacent we'd become in the past with the comfort of an established routine of staying home. There's no room for complacency in our lives now with so much world to see! As we began the walk outdoors toward the beach, we turned around hoping to capture the main building behind us. John at the front desk was friendly, welcoming us with much enthusiasm. As taxi driver Chris pulled up to the resort, we were immediately struck by the massive wood security doors opening only after a security guard checked us out, confirmed our reservation and allowing us to enter. The long walk through the complex began through this elegant walkway lined with pillars and the most beautiful flowers. The air was permeated with their intoxicating scent. The awe inspiring entrance immediately set the tone for what we'd anticipated to be a special evening. We weren't disappointed. John, the concierge, pointed us down the flower covered walkway directing us to follow the long path toward the ocean and the pool where we'd find the restaurant. What's with my outfit? My skirt was wrinkled and misshapen. Do I really have to start ironing again? Always smiling! Wrinkled clothes don't phase him, not his, not mine! ﻿Having seen photos online, we knew if we could find the pool, we'd have reached our destination. After walking for several minutes, we'd begun to wonder if we'd gone the right way. We forged ahead to the sound of the surf which proved to be the perfect guide. These are the apartment buildings where units are sold for owners for their own use and to rent to tourists, managed by the resort. As we continue onthe walk, we passed many smaller buildings with individual condo units. Poorly lit we didn't want to disturb occupants with our camera flash. In the US and other countries, there are endless codes and ordinances requiring handrails, lighted walkways and stable pathways with the intent of reducing injury and accommodating the elderly and/or disabled. Le Café is located by this outstanding swimming pool, creatively designed to capture the essence of the subtle Moroccan theme of tranquility and splendor. In Kenya and many other parts of the world that we've visited thus far, no such codes exist or, if they do, they aren't enforced. Even the finest establishments are lax in providing ample lighting and stable walking areas when often a long walk is required from road to beach. Notice how the server in this photo was waiting for us. Apparently, John at the front desk had called ahead alerting him to our pending arrival. Mindful of this situation, especially after our horrible fall when the steps collapsed beneath us in Belize, we take special precaution when walking on uneven and poorly lit ground. Shortly after we arrived a small group gathered at the far right end of the bar resulting in lively and animated banter pleasing to hear and see. But conversation was not lacking at our quiet table for two, with many staff members graciously stopping by to chat and welcome us, as we gushed over our memorable experience. ﻿Both blind, Tom's mother (sadly lost to us 5 years ago) and brother Jerome resulted in his learning to be the perfect guide over rough terrain. Also, after years of working the rough roads in train yards, he's adapt at managing the worst of conditions. Me, the "queen of trip and fall," always in a hurry until now, paid little mind to what was under my feet. It was easy to imagine a sunny day lounging in these chairs, dipping in the pool from time to time. Last night, as we made our way in the dark, my champion at my side, I felt safe and secure that we'd arrive in one piece. Of course, we did, our mouths agape at what we encountered when we arrived at Le Café. Looking at Tom, as we entered the restaurant, I said, "Even if the food is mediocre, I am happy to be here." It was that breathtaking! The food was not mediocre! This foot bridge over a portion of the pool was clearly a photo op. I should toss this frumpy shapeless skirt having one less item to pack. Seated at our table of choice closest to the pool and the beach, the guest's comfort in this unique establishment was obviously of utmost concern. As we sunk into the exquisite padded chairs we couldn't help but notice the soft bright white linen tablecloth and the matching napkins, appropriately placed on our laps, as a flurry of discrete activity skittered around us. Our drink orders filled, the menus delivered at precisely the correct moment, we were greeted by name by the kindly General Manager Gillie, with whom I'd made the reservation online. What a nice touch! Chatting with her for several minutes, we felt welcomed and at home. These were only two pages of a multiple page menu. Our waiter, graciously served our needs, answered questions, didn't bother us too much, somehow knew exactly how we preferred to be served. Later, the restaurant manager stopped by, offering his welcome, asking a few questions about our stay in Kenya, inviting us to return for more lavish care. We will. We absolutely will! Tomorrow, we'll post Part 2 (memory issues at this time restrict the number of photos posted at one time) with our menu selections (including the accommodation of my food restrictions) with photos and...the unbelievable pricing for an evening well spent along with the total cost for our evening including taxes, cab fare and tips. To the right, is Hesborn's quarters where he lives until Saturdays at noon returning early on Monday mornings. He boards the local matutu a rickety old van bus service in order to visit his family in Mombasa. The 2 hour drive and ferry ride to Mombasa is Kenya Shillings $400, US $4.58 round trip, often breaks down en route. Although Hesborn is gone we continue to have security on site around the clock, as is always the case, 7 days a week. When we began writing this blog in March 2012, our intent was to keep a diary of our travel experiences to share with our family members and friends. At any time they could type in our web address: www.worldwidewaftage.com to see what we're doing today. Today's post in #411. We've been gone almost a year! The locked and guarded gate to ours and Jeri and Hans' house. After a few weeks of posting about the process of a retired couple planning to travel the world for years to come and the endless preparations, we discovered much to our surprise, that readers were reading our posts from all over the world, now at almost 100,000 and growing rapidly. As readership continued to grow worldwide, we added advertisers to offset the continuing costs of maintaining a website and registered Worldwide Waftage as a business, enabling us a few benefits from time to time. Now, we've found we're able to receive small discounts on occasion as "travel writers." 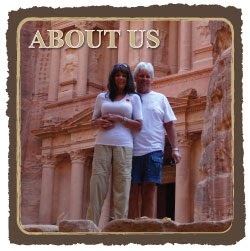 As you can see, we often write reviews for places we've stayed, visited and restaurants. It makes sense with the tremendous amount of vegetation around us, that mosquitoes are impossible. With intermittent rains, the mosquito population continually thrives. Only a handful of readers have signed up to receive the automatic email as shown in the right side of the page. These are a few folks who'd prefer to get the most recent post in an email, rather than go to their bookmark each day. Many prefer not to receive additional email which is entirely up to you. Since the most recent post doesn't usually arrive by email until the day after posting, many prefer not to sign up to receive it. Creating a bookmark is easy, allowing the reader to look for it within a minute of my posting it. Tom and I have tested this and its almost instantaneous. Either way you prefer is fine with us. These pods are fascinating. They look like pea pods but no one seems to know if they're edible. To be safe, we won't use them in a stir fry. Never, at any time will we take away the personal nature of our postings. After all, it's very personal to us, often sharing the most minute details of our daily lives, our thoughts, our difficulties and our dreams for the future. Yesterday, our post held a special meaning for us. Two of our regular readers, both of whom have posted comments at the end of posts in the past, both posted comments yesterday. Each of their observations meant so much to us. If you'll go back to the post from yesterday, September 27th, you can read their much appreciated comments and our response at the end of the post: Click here please and scroll to the end of that post. These were often seen in pots in the US. Here they are almost the size of a tree. We encourage you to comment. If you agree or disagree with us, if you have suggestions for us, if you have warnings for us, or if you simply want to say "hi," share a recipe, share a travel experience or for that matter, share any experience, we'd love to hear from you. We publish and respond to every comment we receive except those of a pornographic nature, those that may offend others for any reason, or those that are promoting unrelated websites that serve no use to our readers. This will never be a place where we'll "hound" our readers to buy something. Away from our family and friends which may prove to be for extended periods, we have few interactions each day except with one another, while living in many remote areas. Our world is not only that which surrounds us each day but is also, every one of YOU. If you don't travel or can't think of anything to say, tell us about a new TV show or movie we should download, or the weather where you live or...if nothing else, tell us your mindless drivel as we tell you ours almost each and every day. We'll be back tomorrow with photos of our outing tonight. See you soon! If it comes back in time before we head out to dinner tonight, we'll certainly post as planned. If not, we'll be back tomorrow (hopefully). This is the fifth time the power has gone out in the past few weeks, usually lasting three to five hours. We shall see what transpires today. Hope to be back later today! This is where we'll lounge in the chaises at Madafoo's in a guarded area, overlooking the Indian Ocean each Wednesday going forward. If it rains, we'll either wait until it stops or go the next day. It's Friday morning. The sun is shining. The temperature is currently 82F, 28C the humidity is about 75%. There's a slight breeze. If we listen carefully, we can hear the singing of no less than 10 bird species, many with what have become familiar "tunes." ﻿﻿﻿﻿﻿﻿﻿﻿﻿﻿﻿﻿﻿﻿﻿﻿﻿﻿﻿﻿﻿This appealing view enticed us to make Madafoo's a regular spot to visit. The goats in the yard are silent at the moment soon to begin their intermittent "baaing," pleasing to our ears. A few days ago, the mom goat, jumped over the stone wall, running around the neighborhood. With the homes enclosed by the tall security gates and walls, she'd be found. Hesborn searched, finding her a few hours later. While she was gone, the baby goats cried constantly, loudly, persistently. We couldn't help but laugh. The swing that visitors are welcome to use. Guards hovered in this area patrolling both the resort and the beach. The bottoms of our feet aren't black anymore. The mosquitoes seldom bite me now with my scheduled application of the non-toxic lotion and BugsAway clothing at night. The giant black wasp continues to visit several times a day but we don't nervously move away, instead keeping an eye on it until it flies away. It always does. A birthday cake and the traditional song was presented by staff at Madafoo's to celebrate a patron's birthday. We're managing our meals with limited ingredients, accepting that there will be repeats almost every week The ice cube bin is kept full by our frequent emptying and refilling of the tiny trays, one of which is ours, that freeze quickly in the miniature freezer. I've become used to drinking homemade ice tea and Tom has been drinking plain bottled water since the Crystal Light ran out weeks ago. Leaving Madafoo's for the long trek home, we took a photo of their sign where many visitors come to rent surfboards, arrange for para sailing and other water activities. Stepping onto the beach, we were ready to tackle the soft sand for the long trek back. With Hesborn only doing laundry once a week, we manage our clothing by hand washing anything we may need. It takes two days to dry. We re-use our bath towels, hanging them to dry, finding them still damp the next day, only to use them one more time to reduce molding wet laundry. The cleanliness of the uncluttered beach made us feel as one would if taking the first human step onto an uninhabited island. The local fisherman, working in the sea to earn a living, catching fish they sell to the restaurants. Next week, we'll have been in Kenya a full month. We've adapted. Finally. So we'll carry on, enjoying each day as it comes, striving to live in the moment when not required to plan for the future. Its all good. Once again we were walking on the lengthy pathway from the sea. This pod baffled us. Any ideas as to what it may be? Back to our entrance, we were grateful for our time away. But we were also glad to return to strip down to our bathing suits, drink more water and relax after the long strenuous walk in the heat. Of course, I couldn't wait to download the photos to see how they came out! The sea, the clouds and the mystery of ominous clouds rolling in, left us in awe with our mouths agape. As we approached the exit gate from our neighborhood, Nancy, the daytime guard greeted us both with a warm hug. At night the security is beefed up when more security risks are prevalent. With numerous warnings about dangers for tourists walking the beaches in Kenya we've hesitated to explore these past three weeks. Approximately, one third of a mile from the entrance gate to our community, is a beach access sign leading to a long rough walking path. Off we went this morning. Carrying only a camera, bottled water and a small amount of money, we began the long never-seeming-to-end walk toward the sea. On the walk to the beach access, these two women were carrying what appeared to be heavy loads atop their heads, a common site in Kenya. After no less than 15 minutes of carefully maneuvering over rocks, pots holes, tall grass and uneven ground, we suddenly felt a cooler breeze wash over us in the scorching heat while hearing the roaring sound of the sea. It was 5 1/2 months ago that we walked the beach in Belize. Reaching the beginning of the beach access, it was impossible to see how far we'd have to walk to reach the sea. This lonely stretch would be dangerous to travel at night, which of course, we won't do, always taking a cab to dine at any of the restaurants along the coast. My breath caught in my throat as my eyes beheld the beauty, pristine, uncluttered with debris, a vast landscape of pure beauty. Thankfully, the tide was low. We'd forgotten to check online having heard that walking on the beach was impossible at high tide as the water rose to the walls protecting the various hotels, resorts and private properties. In places, the path to the beach was filled with flowers. Unfortunately, clouds rolled in minutes after our feet hit the sand. Neither of us concerned about being rained on, we trekked on, determined to take advantage of the time and effort it took to arrive. We weren't disappointed. Bougainvillea flourish with little water and no care. They are everywhere including the narrow path to the beach. Sensitive to the risks along the beach, we engaged in the friendly Swahili greeting, "jambo" with the local peddlers who approached us on several occasions. We politely declined their vigorous enticements to get us to purchase their locally crafted wares. We have neither use nor inclination toward trinkets being added to our already heavy bags. At points, the path felt like any walkway in any neighborhood in the US where flowers grow in abundance. Most of the peddlers were members of the Maasi tribe, a friendly group of people, dressed in elaborate colorful garb that is appealing to the eye. Of course, I'd have liked to take a photo of their tribal dress. But we knew that doing so would require payment, make us appear as more potential prey and give off a signal of "Hey, we're tourists." The variations in color always catch our attention. At long last, we reached the end of the path. We were thrilled to have the sea in front of us once again. We didn't take time to take photos of each other. Pouring sweat in the outrageous humidity and heat, neither of us were "photo ready." Recently, we'd read online about a restaurant/resort, Madafoo's that has free wifi to anyone that makes a purchase at their outdoor restaurant and bar. Checking it out for future reference proved to be ideal. Welcomed heartily as we entered the guarded gates, we felt determined to make a weekly visit a part of our plans. As we exited the path to the beach this was our first view to the right of us. Continuing on we chose to go to the left where we knew we'd find the numerous resorts and hotels. Miles of sandy beach stretched in front of us. The white sand was the softest sand we'd ever walked, our feet sinking in several inches with each step. As a result, walking was laborious, especially in the heat and humidity. This didn't deter us. We forged ahead. We enthusiastically talked that starting next Wednesday and every Wednesday going forward, we could arrange for a taxi ride to Madafoo's, carrying our laptops and plug ins in a bag in order to spend several hours dining for either breakfast or lunch, using the free Internet and partaking of their comfortable padded chaise lounges, positioned to face the sea. Numerous fisherman were attempting the "catch of the day" to later be sold to the resorts and restaurants along the Diani Beach coastline. It appeared that a few of the small boats were unattended with traps set. Bigger than the largest dog's footprint, we were baffled as to the origin of this massive print. Any ideas out there? Upon inquiring, the staff explained that we are welcomed to use the chaise lounges, the plug ins and their free wifi should we dine in their restaurant at any time. For Kenya Shillings $3100, US $35.47, we can dine on any item on the menu, pay for cab fare both ways, including tax and tips. A young Maasi member walked in front of us on the beach, surely weighing no more than 80-90 pounds left this huge indentations in the sand. Increasing our outings away from our house adds greatly to the enjoyment of our remaining time in Kenya. Thus, with dining out on Saturday nights experiencing a new restaurant each week, grocery shopping on Tuesdays mornings and now a trip to Madafoo's each Wednesday (either morning or afternoon), we find ourselves with more planned activities to anticipate. This is good. The first private residence we encountered on the walk along the beach. With ample dollars factored into our budget for dining out, its unnecessary to make any changes to the overall budget. Plus, we'd budgeted US $1000 for cab rides during our three month stay which would translate into taking a cab six out of seven days a week, highly unnecessary and unlikely. The savings at three times a week more than pays for the cost of the food, tax and tips at Madafoo's on all Wednesdays going forward. This hut was located at The Sails Restaurant, part of the Almanara Resort where we dined almost four weeks ago, still #1 on our favorites list. ﻿﻿Walking back a few hours later, we stopped at the local produce stand purchasing four eggplants and a bag of carrots at a total cost of US $1.14. Sweaty but invigorated from our walk, we were both happy to return to remove our sand filled shoes, to make a fresh glass of something cold and to continue our daily power lounging in our outdoor living room. The waves were generally this size but occasionally, we saw a surfing worthy wave. Bathers tentatively wading out into the sea, appearing mindful of the undertow and possible jellyfish and stingrays, less common here than on the beaches of Belize. That's it for today folks. With more photos than we can post in one day, we'll return tomorrow with Part 2.